Representative Honours: Northern Ireland: 5 Full Caps / 1 Goal (2010-2011). Club Honours: (with Coleraine) Irish League Cup Runner-Up 2009/10; North West Senior Cup Winner 2009/10; (with Linfield) IFA Premiership Champion 2011/12; (with Derry) FAI Cup Winner 2012, Runner-Up 2014; Setanta Sports Cup Runner-Up 2012. Awards: Ulster Footballer of the Year 2010; NI FWA Player of the Year 2010. Rory Patterson enjoyed a prolific 2009/10 season with Coleraine and by the time of his international call-up for the March 2010 friendly with Albania had already scored 31 goals for the Bannsiders. He made his Northern Ireland debut as a second-half substitute during a shambolic 1-0 defeat in Tirana. A native of Derry, Patterson had trials with a number of cross-channel clubs prior to signing with Rochdale where he played alongside Pat McCourt and Lee McEvilly. Sammy McIlroy considered including Patterson along with McCourt and McEvilly in the Northern Ireland squad that faced Spain in 2002, but the powerfully built striker had to wait eight years for Nigel Worthington to finally give him an international call. The in-between-times were difficult for Patterson. He received call-ups for both the Northern Ireland and Republic of Ireland youth teams before he was released by cash-strapped Rochdale and found himself playing part-time football for a number of English clubs. His best spell prior to joining Coleraine was with FC United of Manchester where he scored a total of 107 goals in 126 games. In January 2010 Patterson agreed a deal to play with Glentoran for the 2010/11 season. Despite this, he joined Plymouth Argyle for a three day trial in March 2010. A few weeks later he finished on the losing side in a penalty shoot-out againt Glentoran in the Co-Operative Insurance Cup final having scored to put Coleraine 2-1 up. In his only season with Coleraine he scored 30 IFA Premiership goals, plus another 11 in other competitions, to finish as the league's top goalscorer. He bagged four goal hauls against Glentoran and Crusaders and hat-tricks against Ballymena and Glentoran (again) and also claimed a North West Cup winner's medal following a penalty shoot-out final win over Limavady. Without having played a game for Glentoran, Patterson signed for Plymouth for an undisclosed fee on 5th June 2010. He made his Pilgrims debut on 7th August as a substitute in a 1-0 win at Southampton on the opening day of the 2010/11 League One season and scored his first goal a week later in a 1-1 draw with Carlisle. 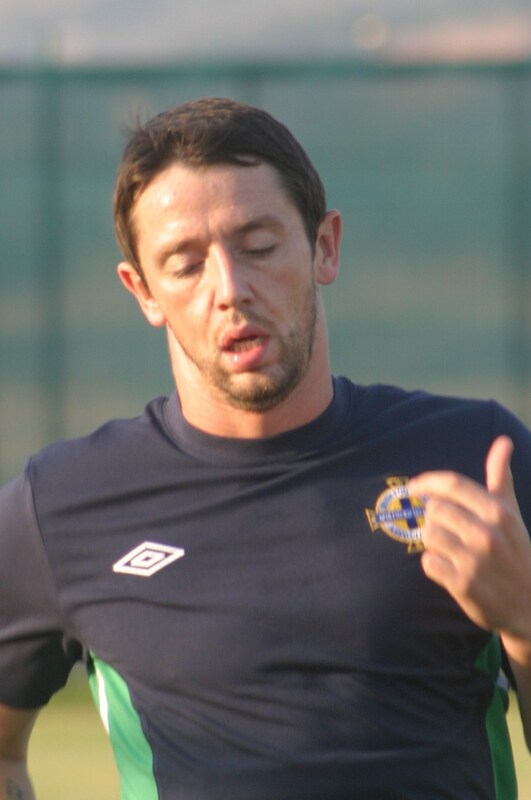 Having led the line for an inexperienced Northern Ireland side in their 2010 tour of the Americas, Patterson recorded his first international goal from the penalty spot in a 1-1 friendly draw against Morocco in November 2010. His last cap to date was in the opening match of the Carling Nations Cup, a 3-0 reverse against Scotland in Dublin. After Plymouth's relegation at the end of the 2010/11 season, and with the club in financial turmoil and unable to pay players' wages, Patterson returned "home" to join Linfield on loan. Blighted by a broken wrist and with an ever-changing attacking partner, Patterson proved a steady if unspectacular goalscorer while at Windsor Park. In January 2012 his loan move at Linfield was cut short as he joined home-town club, Derry City on a three year contract. His final act for the Blues was to score a hat-trick in a 7-1 Irish Cup win over Ballyclare Comrades. His contribution in the first half of the season was enough to earn him an Irish League winner's medal. For Derry Patterson scored twice in the 2012 Setanta Cup final 2-2 draw with Crusaders, plus another in the deciding penalty shoot-out defeat. That November he came off the bench to score twice as the Candystripes defeated St Pat's 3-2 after extra time in the FAI Cup final. Patterson continued as a regular scorer over the next two seasons, but after Derry suffered a poor 2014 season, culminating in an FAI Cup Final defeat by St Pats, left the club without European football and a tight budget his contract was terminated by mutual consent. Patterson spent a prolific season in Australia, before returning to FC United. Summary: 4(1)/1. Won 0, Drew 1, Lost 4. Picture coutesy of Roy Cathcart.